OH MY GAWD! I did a taste test this morning and here are my findings: While I LOVE the taste of coffee, I don't drink it, never got hooked on it, but love the flavor and scent. I like it, but it does not like me. However, I LOVE grinding fresh, gourmet coffee beans every morning for my man, and inhaling the aroma. I brew a pot of his favorite beans, a custom blend that I create. So, I recognize and appreciate really good coffee! 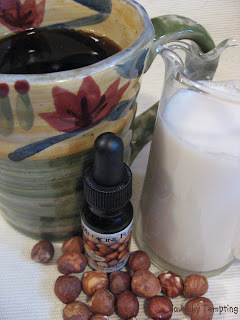 I took W's fresh brewed coffee and added ONE drop of Medicine Flower Hazelnut Extract to one cup of black coffee. It was the BEST tasting Hazelnut coffee I've ever had!!! I used to drink Hazelnut coffee many years ago. The aroma, the flavor - AMAZING! So here's another use for Medicine Flower Extracts. If you are a coffee drinker (and tea too, although I've not tried it yet), a drop of Medicine Flower Extracts can transform your beverage into an intoxicating elixir!!!! Note: The milk in the pitcher is fresh almond mylk. That sounds really WOW WOW!!! !